I have a passion for writing and reviewing cruise ship travel, tips, etiquette, and packing hacks that makes cruise vacations better. Are Tipping Practices Sinking or Are We Going Overboard? Cruise tipping and prepaid gratuities are a hot topic, and one of varying opinions and practices. Cruise lines claim to add prepaid gratuities as a "passenger convenience", but it seems that some folks would beg to differ. As someone who did not generally tip beyond the "prepaid gratuity" amount, I decided to educate myself to determine if this was really the best decision and to share my findings with others who are in the "same boat". This project was a very eye-opening one. Keep reading to see what I discovered. One of the first things a new cruise passenger learns is that ships are registered in other countries, while their headquarters are located in the United States. This is how cruise companies are able to avoid U.S. labor laws. In a nutshell, this means that crew members are not paid according to the U.S. minimum-wage standards. As a frequent cruiser, I often engage in conversation with the crew members who take care of us most frequently—our stateroom attendants and main dining room wait staff. My husband and I enjoy learning about their backgrounds, families, and even how they spend their free time on board. They most often work 7–10 months at a time and 12–14 hours per day for seven days straight before having a half or even a full day off. We have also taken a few of the ship's "backstage" tours, and were able to see where the crew members reside, dine, kick back to relax, etc. If you can afford to do this just once, it's highly enlightening and educational, and we totally recommend it. 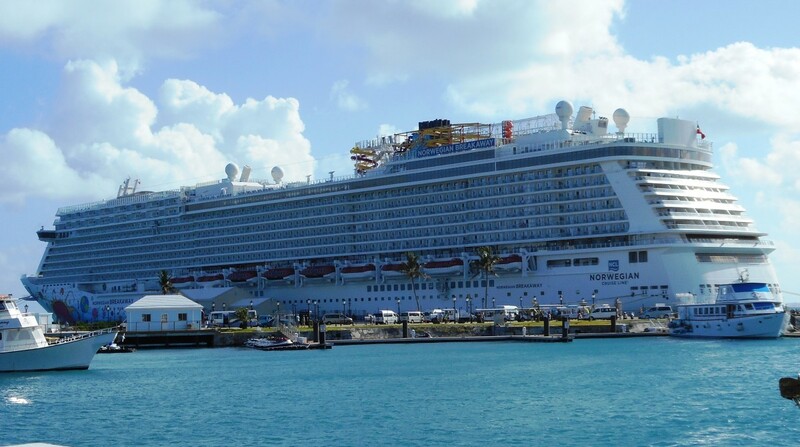 Crew members have also expressed the importance of filling out the post-cruise survey, explaining how heavily these influence their compensation and bonuses. In addition, we learned what their contracts include, and that is room/board, food, and their return trip back to their home country at the end of their contract. However, their actual hourly wages are much less than one would think. Rather than speculate or express personal opinions, I have researched the most credible sources to find reliable data and figures to share in this article. 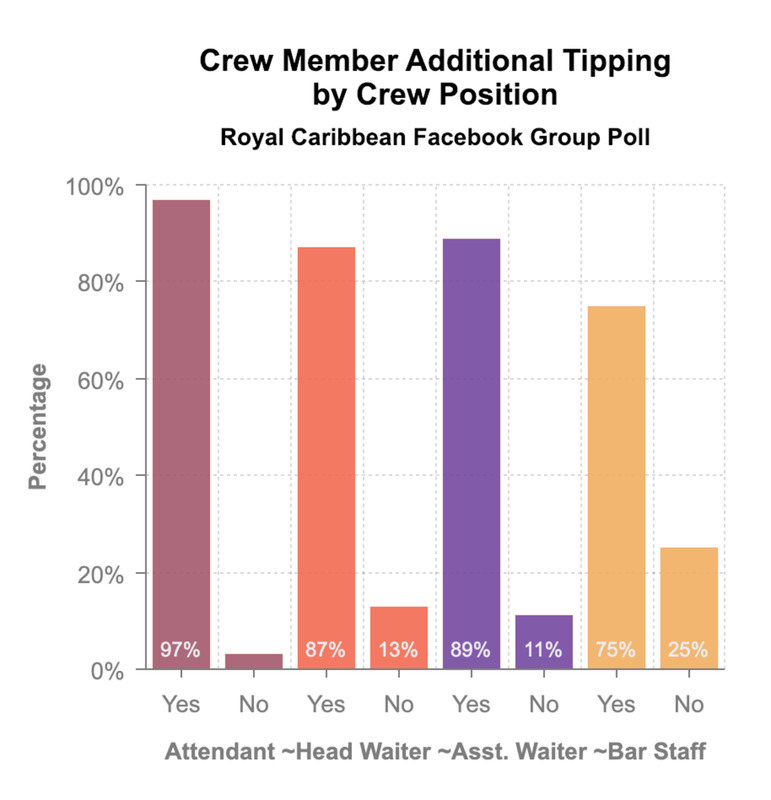 I have also taken the time to collect data via polls from numerous cruisers in the large Facebook cruise group of over 92,000 that I follow, regarding tipping practices...I will share those stats later in this article. U.S.-owned cruise companies have managed to create the ideal context for contemporary corporations: very little government oversight of labor relations, an available pool of very cheap labor dispersed across the globe, lax environmental regulations, high profit margins, and corporate tax rates around 1%. 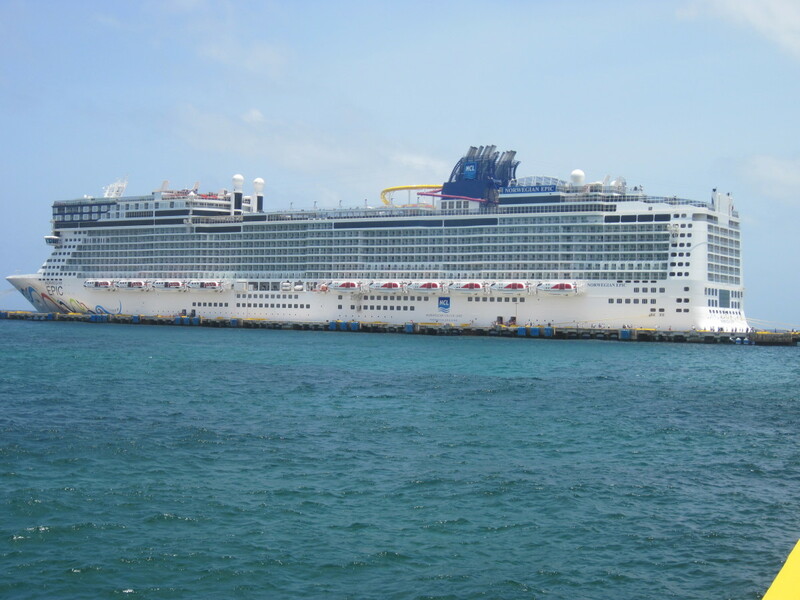 A typical cruise ship leaving the U.S. contains workers from 75 to 90 nationalities. Crew members performing menial service work are recruited exclusively from “poor countries” in Asia, Eastern Europe, Latin America, and the Caribbean. Crew members typically sign 10-month contracts stipulating 10-14 hour workdays/7 days a week without vacation or sick days. There is a striking correlation between workers’ pay/status and their countries’ position within the world system. Although these companies were founded in the United States, the FOC (Full Operational Capability) system allows companies to choose which countries’ flag under which they fly. The “flagging” country then assumes responsibility for supervising and enforcing the ship’s compliance with their national and international regulations on ship safety and working conditions. Panama, Liberia, and the Bahamas currently account for 50% of the FOC business. These countries charge registry fees and tonnage fees, but companies are not taxed on any of the revenue they generate on ticket sales, tours, and shipboard purchases. If they flagged ships in the United States, they would be subject to domestic labor laws and corporate taxation. Seafaring workers have explicit rights enshrined in international law (freedom of association and collective bargaining) and they are specifically covered by the International Labor Organization (ILO) and International Maritime Organization (IMO) conventions. ILO Convention 147 (1976) explicitly states that each country that registers ships (flag state) must pass laws specifying minimum standards for employment and living conditions. This convention also states that employers must pay for travel costs associated with taking a leave. ILO Convention 180 (1996) specifies that seafarers should work no more than 72 hours in any 7-day period. Critics of the charges say tipping is a personal matter that should be left to passengers. Some see the charges as a thinly disguised method for cruise lines to push the responsibility for paying crew members to their customers. 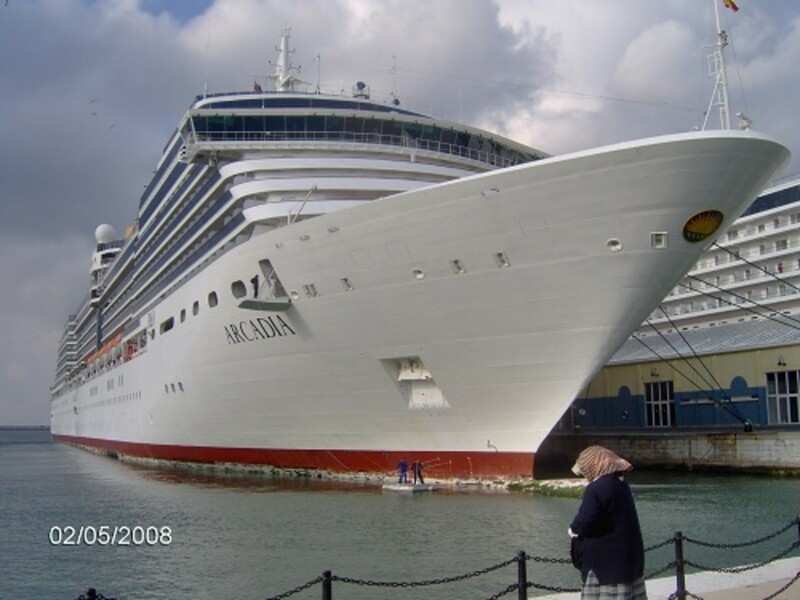 To that point, cruise industry watcher CruiseCritic has reported that some lines now pay housekeeping and dining department workers on ships as little as $2 per day in base wages, relying on the automatic gratuity to provide the great bulk of their compensation. As much as 95% of pay for some cruise ship workers now comes from automatic gratuities, according to CruiseCritic. In this same USA Today article, you will also find a breakdown, by cruise line, listing the varying daily automatically-added gratuities, as well as other additional service fees. Some lines have admittedly started including the gratuities into the fare, which makes it even more difficult to ascertain just how much is actually going to the crew members. How Are the Prepaid Gratuities Distributed Amongst the Crew Members? According to Royal Caribbean's website, prepaid gratuities are used and distributed in the following manner, which does not specify exactly which "other" crew members beyond those serving food, drinks and stateroom attendants receive this money; or what percentage. They also go on to say that folks still have control over this charge and may have this amount adjusted by guest services if they feel there is a need to do so. It is my hope these funds are also shared with those preparing the food, handling baggage, cleaning the ship and recreational areas, guest service attendants, and those who run the children's programs who would not normally be in the public eye to receive optional tips from passengers. Bar and spa services also have service fees added to each transaction at the time of purchase, which is in addition to the prepaid gratuities. In that case, it may not make sense to add additional tips to those bills, although from the polls that I conducted, most people do, which I will touch on as well. 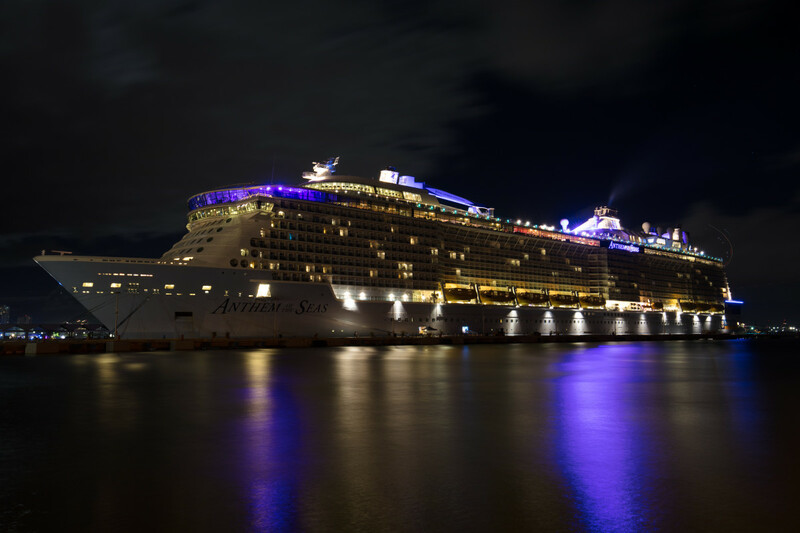 In the unlikely event that a guest on board being charged the daily automatic gratuity does not receive satisfactory service, the guest may request to modify the daily amount at their discretion by visiting Guest Services on board and will be able to do so until the morning of their departure. 61% tip their stateroom attendant an additional $20–$40 per couple, per week, 26% tip $40–$70, and 13% tip an additional $70–$140. The average amount tipped to the head waiter came out to be an additional $20–$50 per week per couple. The average amount given to the assistant waiter per couple for a 7–day cruise averaged about 1/2 of the head waiter's tip to anywhere from $1–$5 per person, per day and often was dependent upon whether they also brought wine or alcohol from bar, in which case, they stated they tip on average, $1 per drink. 75% of people stated they tip the bartender and/or bar server $1–$2 per drink, in addition to the service charge of 18% that is also added to each drink bill, with the exception of those who purchased the prepaid drink package. A number of people stated they do not eat in the main dining room (MDR), therefore do not tip additionally to the wait staff. Figures not included in the above numbers are by those who tip a portion of their gratuities at the beginning of the cruise and another portion at the end, depending on the level of service they received by the above-referenced crew members. Surprisingly, there are a large number of people who tip in this manner. Another portion wrote that they prefer to tip their wait staff each meal, including the buffet or other dining areas. Other crew members people stated they tip are: Ship tour guide, pool staff, Kid's Club and nursery workers, photographer, hand-washing attendant at the Windjammer entrances, piano player, room service attendant, omelette maker, or a specific bartender they visited most frequently. Some people expressed they reside in a country where tipping is not a customary practice, therefore, do not feel the need to tip at all while cruising. A small number stated they have felt the crew members "make enough money or prefer not to tip at all" or they received poor service overall, therefore request to have their prepaid gratuities removed. 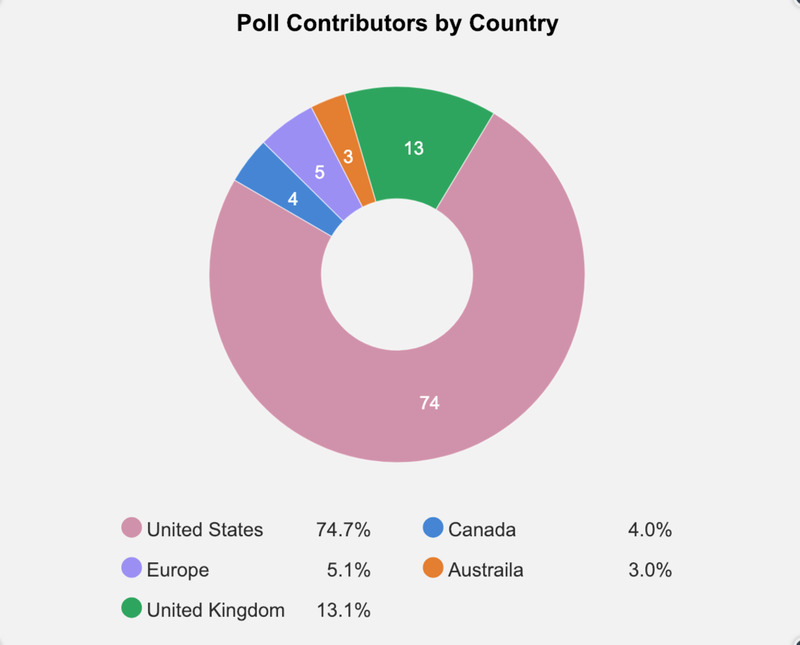 79% of the contributors to this poll were female and 21% male. 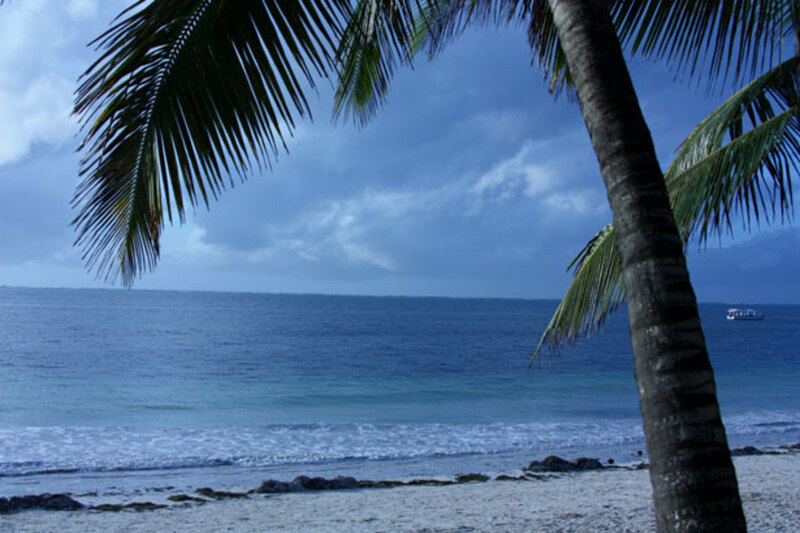 I love to write articles and reviews about our cruising experiences, which many folks have found to be helpful. I hope you all find this one informative and helpful as well. Thank you to everyone who contributed their comments, data, and opinions for the sake of pulling this information together. It is of the utmost importance that I provide the most unbiased, factual, and accurate data I can compile, and I will continue to collect additional data in order to keep this information as current as possible. 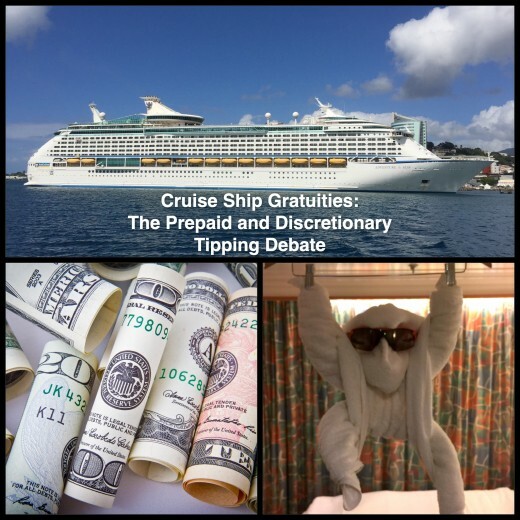 Do you tip some or all of the above crew members an additional amount beyond your prepaid gratuities? If you have enjoyed this article, please check out my musings on cruise ship cabin organization! Me too. I had to write the article neutral and unbiased so to appeal to every varying opinion. Personally, we tip extra...but didn't used to to the degree we do now. We are way more generous knowing what we know now! I read your entire article. I find it distressing when I hear someone automatically say they go down to Customer Service and cancel their automatic gratuity every cruise they go on. I am 65 and always remember one important saying that my parents said to us: "You get what your pay for!!" By the way, the ship has a way of putting notes in your accounts, about the removal of the automatic gratuities. It is seen every time your Sea Pass is used. Being that most of the crew get pennies on the dollar from the automatic gratuities, they subsist on the extra tips they get. I could write an entire article myself about how it feels to work in the food and beverage industry waiting on people and the "CHEAP" ones that stiff you. Enjoy your cruise and make the people that wait on you hand and foot enjoy waiting on you. In Prague we noticed restaurant staff pointing out to English-speaking guests that service was not included, when in fact it was. Globally the issue of tipping is confusing. It gets even more complex when people who are not from the US are not accustomed to tipping in their country because folks there are paid a respectable wage vs. companies relying on gratuities to carry them. 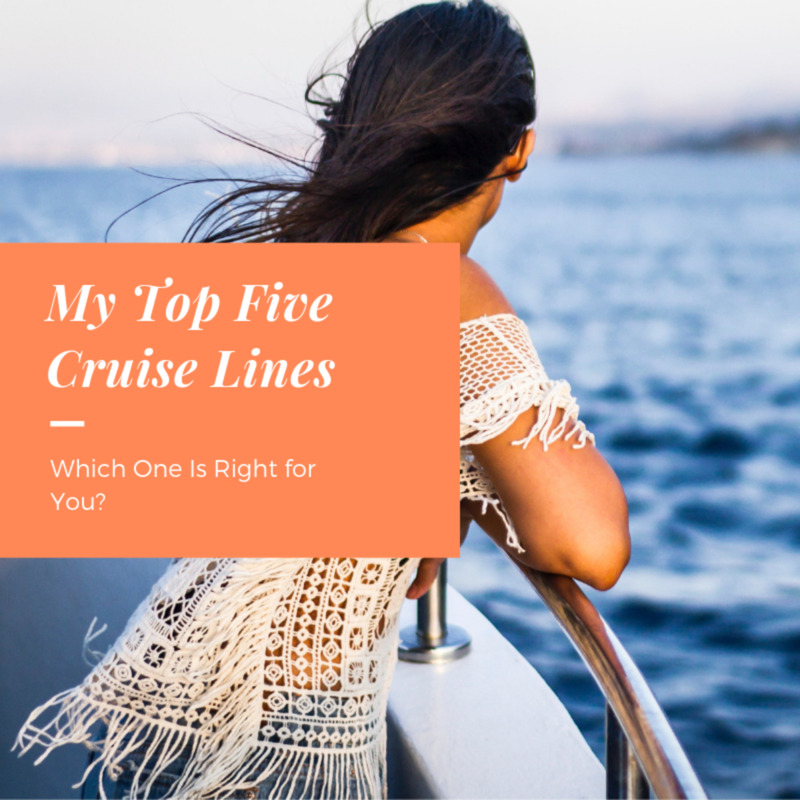 You can't even imagine how ugly this topic gets on the cruise forums that I follow; it's an ongoing and often times, heated debate, so I thought it would make for an interesting topic to go with my other cruise blogs. I have read your article with great interest as we have relatives taking a cruise later this year. The whole issue of tipping and gratuities is a complex one.